I’d be lying if I said my favorite thing about shooting street-style in Chicago isn’t the background of the city itself. When I come across someone like Angela, whose sense of individuality and color is so strong, it makes shooting that much more exciting. 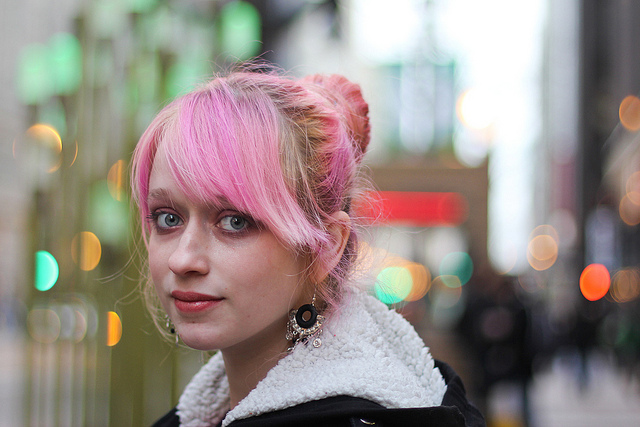 The current State Street art installation is an exceptionally interesting background, even more so when combined with Angela’s vibrant pink hair. Editor’s note: I didn’t have time to flesh out my thoughts about Angela’s look earlier today when I posted this. As a street-style photographer Angela is exactly the type of person I spend my days looking for. Street-style isn’t about fitting in or even rocking the latest trends, it’s about using your appearance to create an individual look. The most fashionable statement of all is to just be yourself. It’s not a cliche, it’s the truth. To the untrained eye, you might not understand why I was attracted to Angela’s look. What I see in her is the deliberate and restrained use of color. She was smart and used simple black pieces to ground the exuberant colors. 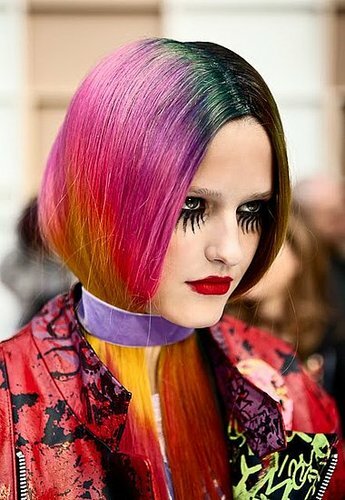 Visually I’m reminded of the look below from Meadham Kirchhoff’s Fall 2012 collection with the strong emphasis on stripes and precise use of pink, even up to the hairstyle. I think Angela was shocked that I loved her look so much since we aren’t used to celebrating uniqueness in fashion. If anything, people are encouraged to suppress who they really are to fit into whatever sub-group they’ve gravitated towards. Even though they might consider themselves to be anti-mainstream they’re still engaging in conformist behavior, they just deny it (thought it’s quite transparent and evident to anyone with a pair of eyes). It’s really hard to find people who stand out on their own, and again, that’s what true street-style is all about. I want to challenge you all – my readers – to open your minds beyond the fashion establishment trend factory. Just because what someone is wearing isn’t the subject of trendspotting pages in the glossy fashion magazines doesn’t mean it’s not style. I challenge you to think about what true style really is. Because I’m an over-educated daughter of a professor I get all conceptual on your asses – I know – but seriously, the mission for my blog is to provide an alternate voice on fashion centered on the individual human being. If you want to know what’s “hot” or “on trend” then there are plenty of blogs dedicated to just that. Although I still cover trends because I find them fascinating, the purpose of my blog is to be dedicated to the concept of individuality. Trends or no trends. I wish I was one of these girls who put so much energy into looking perfectly put together. Everything about this woman’s vintage-inspired look is delightful, from the brooch on her collar to the side bun. I guess instead of actually being this type of girl, I’ll write love letters like this blog post to the idea of being so precise. You know, when I’m drafting posts sometimes it really does feel like a love letter to the person I’ve photographed! EDITOR’S NOTE: Within 10 minutes of posting this tonight, the woman above was successfully identified as as Kater of the fashion blog All This Happiness. Follow her on Twitter, @katerspie. Thanks Sandy! Hanne Gaby Odiele is well known for always dashing between shows in ultra-sporty ensembles. Her sleek individual style predates the current athletic trend sweeping through fashion. Perhaps Hanne served as an inspiration for designers like Alexander Wang and the boys at Rag & Bone, two labels that have championed the aesthetic during recent seasons? I’m always fascinated to see how models dress in real life since they are such chameleons on the runway.